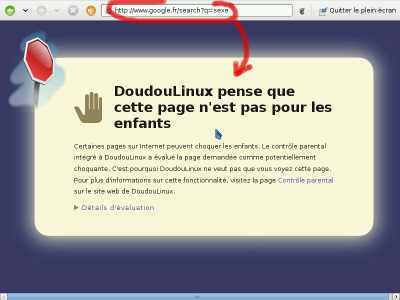 Recently I discovered a new kind of Linux: DoudouLinux. It is not a new distribution, but a Debian is a tailor-made for children, the designer Jean-Michael says that is usable by children two years old. And in fact by starting this live meta-distro you get a rich and colorful menu from which childrens can choose what to play. Intrigued by the project, I asked Jean-Michel an interview and him very kindly accepted to answer my questions, this is also a good chance to introduce his project in Italy and other country where it still is not widely known. Q: Jean-Michel, thank you very much for your time. First, can you tell us something about yourself? How old are you? Where do you live? What do you do for living? When and why did you start using Linux? A: First of all thank you for this interview, this is a good opportunity for our project to tell more about its motivations. Well, I’m 39 years old, I’m married and I have 3 children aged from nearly 4 to 8. I live in France and I work in a mid-size R&D center at providing scientific computing resources to users. I discovered Linux in late 2003 on a workstation at work and this was a kind of revelation. Linux has had a bad reputation in France in late 90’s and I had never imagined facing such polished interface (this was RedHat 9). Moreover when I started computing in 80’s, I found stupid to sell computers without a full set of applications to run on it. As GNU and Linux solve this issue, I stopped using Windows at home in mid 2004 and at work in early 2005, I never had any regret – it’s just the contrary. After having tried many Linux distributions, I settled in Debian which provides me both great stability and great software offer. Q: But now, back on our main topic, what’s DoudouLinux ? and where did you get that name ? A: DoudouLinux is a young project that was launched this summer after 2-3 years of experiments. We want to provide a child OS for standard computers and our model for ease of use is gaming consoles. Indeed gaming consoles are just computers so why should standard computers be much more complicated to use? Additionally as it is based on Linux, DoudouLinux is not this kind of empty OS that are sold in supermarkets neither. Some people would have advertised for DoudouLinux as “The kid OS for human beings” [NDR Ubuntu like] but I chose “The computer they prefer” ;). Concerning the name, “doudou” is a French word that is used to designate the irreplaceable teddy bear or cloth that children carry everywhere and hug strongly when things go wrong. It seems there is no exact English translation, maybe “wubby” would fit. I think you know what Linux is :), so DoudouLinux simply aims at being the OS they prefer and that can be carried everywhere! A Linux for child of 2 years+, really ? can you name some applications shipped with DoudouLinux ? And do you have some feedback from your users (the childs ? ), they like these applications ?. 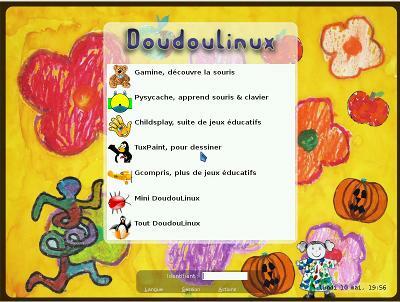 DoudouLinux ships with classical educational games: Pysycache, Gcompris, Tuxpaint, Childsplay, Mr. Potato, etc. There are “work” applications too (calculator, language dictionary, text editor, web browser, etc.). There are multimedia applications to learn the music with a virtual piano and a rythmbox or to record their voice and their music. Finally we also provide games just to have fun – Linux has to be fun too. The philosophy is to select applications that target children or are simple enough to reduce the learning effort. We want DoudouLinux be attractive! I’ve never heard of a child complaining about DoudouLinux, it’s rather the contrary even when it does not become a passion. It seems that each child has its own set of preferred applications and finally finds its own interest. Eventually when they use the most advanced applications they may have questions about files, in Hydrogen for example. But no “I don’t have the latest X or Y” nor “I fear to break this” nor “There is no 3D reality rendering”! And they can test anything, it won’t break, it’s good for self-confidence. Q: And do you had feedbacks from non-geek parents ? A: It’s quite difficult to answer because people do not contact us telling “I’m a 20 years experienced Linux hacker”! However as we have essentially advertised on technical websites, we believe that parents who contacted us are not computer ignorant. Anyway I understood that some motivated geeks spread it in their neighbor with success, probably not geek only. Even a Grandma in the US is now using it! Q: How do you compare DoudouLinux toward the other distro for child ? we recently started to ship built-in parental control, which is not so frequent in child distros! Well, it is supposed to be easy for children but for parents too. We have positive feedback in this direction. Q: So DoudouLinux is Shipped with built-in content filtering, can you explain briefly what it can do and how it work ? A: Of course. It’s based on DansGuardian. To determine whether the page is good or naughty for children, it parses its content instead of its URL. The page text is searched for words or expressions in several languages. Each of them has a naughtiness weight used to compute a global page naughtiness level. It is then possible to block some Google pages only instead of all of them! This also means that if you use the Russian version of DoudouLinux to teach your children this foreign language, they won’t unfortunately visit awful websites while having fun and searching for “sesso” in their mother tongue (I let you check the naughtiness of this Google query…). Of course I’ve looked at more classical (free) blacklists and saw that most of their sites are indeed good! Moreover updating these lists on a CD is a problem. I must also confess that we have black/white listing at work and that sometimes it blocks the good but allows the naughty… It can also be easily bypassed in Google searches by using the Google cache link! In DoudouLinux all web page queries pass through DansGuardian, this is implemented at low-level with kernel network routing rules. So finally I think the only real solution is true web content filtering as DansGuardian advertises. However some tuning is still required for languages unsupported by DansGuardian like Romanian. Q: What’s the roadmap of Doudoulinux, are you planning periodic update, make it become a rolling distribution…or something else ? Right now we are focusing on improving the interface on several aspects both technical and graphical. We also want to add a tool to limit hours of use for parents who fear that they wake up in the night and start DoudouLinux. We have a detailed road map on the page Where does DoudouLinux go?. It is not supposed to be exhaustive and it’s open to good ideas ;). Currently DoudouLinux is based on Debian Lenny and we’ll switch to the future new version Squeeze by mid-2011 in my plans. However we’ll release a new version every 3 months since DoudouLinux is still in development – but it’s not buggy :). Children applications will not be changed until the Squeeze switch but they may be patched to be translated for example. The process to update to a new DoudouLinux version is to be improved but as this is basically a read-only system, daily updates are not required. Finally no rolling distribution, it’s too much work, unless upstream projects get involved. Q: Can you tell us what’s the user base of Doudoulinux at the moment and if it’s mainly used in France or evenly distributed in the world ? A: We’ve seen more than 7000 downloads on our website to which should be added an unknown number of Torrent downloads and “free” copies. Let’s say the magnitude order is 10 000 users while the project was launched this summer, rather satisfying… There is a world map on our site showing that visitors come from more than 100 countries. However our main downloading countries are France, Russia and Vietnam around 30% each. We now expect Italy to come soon in top download countries ;), especially because we have a demo CD for your language. this article could help you in some way ? what roles or tasks are needed at the moment on your project ? and what’s a good starting point to give to the one that would like to help you ? A: As of writing we’re officially 14 contributors with 3 from the Institute of Applied Computer Science in Tomsk State Pedagogical University (Russia). Of course translators are welcome since this is one of the main project goals. But many other skills are or will be needed: art designer, programmer, music composer, web developer, system admin, blogger, documentation writer, screencast creator, community animator (for parents or children), etc. On top of the priority list, translation apart, are programmers, art designers and skills related to advertising. If you want to join us, the best start point is our contribute section and our road map Where does DoudouLinux go?. Once you’ve found a topic of interest you can inform us and start working on it. You can also contact us, tell us your motivation and what your skills are, then we’ll think about how to collaborate. To cut a long story short: if you’re motivated you can surely help the project! Q: Anything you might like to add? Yes, two things. The first one is that we don’t want computers to become their drug as some people are worrying about. We invite parents to take care of weekly duration of computer use just as they should do for TV or gaming consoles. The second one is that children are our future. In our modern world we see wealthy or governing people who want to take control of our Internet, our own data and our own electronic equipment for economical, strategical or political reasons. If we want to be able to escape their plans we need children to really master computers instead of the TV remote control, the finger tricks on touch screens or the gaming console joystick. This is the overall motivation of our project. E: Thank you for this window into the world of DoudouLinux. Thanks for the interview! Thank you very much for this rich interview. I hope that many readers will be as enthusiastic as we are about our project. Now I think everybody wants to know how many hours of DoudouLinux you are enjoying per day ;). Good DoudouLinux! Great work, polished distro, exceptional for kids. Congratulations forJean-Michel and the interviewer . Be sure that all the DoudouLinux team is really glad to see such encouraging comments. And do not hesitate to spread the word too! Fantastic! Good and kind software comes to replace heartless monsters!